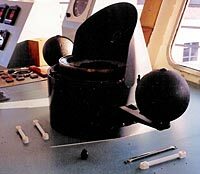 The MagRack™ is a corrector system that allows easy installation of a traditional style ship's binnacle type corrector system beneath an existing console. The magnets are often difficult to install because they are crowded against engine instruments, controls or other navigation gear. If the console is inclined, the for-and-aft magnets will be installed at an angle. Any fore-and-aft magnets placed beneath the spheres will be influenced by the shielding effect of the soft iron in the spheres, causing adjustment difficulties. When the magnets are moved, as is periodically necessary to keep the compass in proper adjustment, the resulting empty mounting holes create a mess. The MagRack ™ solves these problems! The MagRack™ is mounted to the underside of the console, and is easily installed beneath horizontal or inclined consoles. 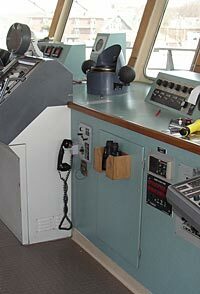 It holds fore-and-aft and athwartship (B and C Coefficient corrector) magnets on a convenient arrangement of shelves, very similar to a traditional ship's binnacle. The MagRack™ can be supplied with or without a heeling magnet system and includes corrector magnets custom fabricated for your application. Please call or email to discuss your specifications. Copyright ©1988 Cape Compass, all rights reserved. Cape Compass �, MagRack �, and Kaufmann Stabilizer� are trademarks of Cape Compass. All other trademarks are the property of their respective owners.